The United States has been blessed with an avalanche of natural resources and gold is one of the most prominent. Even though gold has never been one of the most popular natural resources in the nation, research shows that the valuable mineral can be found all over the country. Here are a couple of tips to help anyone interested in finding gold in the USA. One of the most important things to note about the hobby of finding gold is the fact that you should be ready to get your hands dirty. Gold is one of the heaviest metals in the world meaning they are unlikely to be found lying in the surface of the soil. Gold deposits are therefore likely to be found in river beds, rocks, and streams as gravity pushes them deeper and deeper into the soil as time goes on. 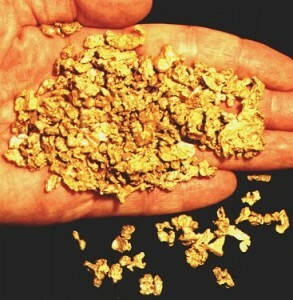 Also, there have been instances of gold nuggets being found in sea water, beach sand, plant tissues, etc. People who are interested in finding gold in the USA should therefore pay attention to locations described above. One great thing about finding gold in the USA is the fact that gold nuggets can be found in almost all the fifty states as long as you know where to look. Historically, states such as Alaska, Arizona, Alabama, California, etc. have been famous for the prospecting of gold. However, states such as Indiana, Missouri, New Hampshire and many others have recently been found to have decent amounts of gold deposits as well. It’s always important to conduct detailed research if finding gold in the USA is a top priority for you. Reports of Geological studies commissioned by the government over the years have been found to be some of the most reliable resources for finding gold locations in the country. These reports are not just detailed but usually reliable in guiding you to find quality locations for gold prospecting in the United States. Such reports also come with quality maps which make it easy to identify these locations while containing details on which lands are available for prospecting or not. If you are serious about finding gold in the USA then you should definitely check out old mining sites and locations which have been mined in the past. Since gold deposits come in various forms and hide in various areas in the soil, no spot can be completely mined. This makes it highly possible to find gold in closed mines and spots that have been mined in the past. For instance you will have a high chance of finding gold in New Hampshire sites such as the Ammonoosuc River, Salmon Hole Brook, Notch Brook, etc. Locations in Vermont such as Bristol, Bennington County and Lamoille County are also popular spots for finding Placer gold. Lastly, you cannot just trespass one someone else’s property just because you are finding gold in the USA. Make sure you contact and seek adequate permission from landowners in order to begin your search for gold. Failure to do this could result in serious legal problems. This entry was posted in finding gold in the USA, Uncategorized and tagged finding gold in the USA by Jim. Bookmark the permalink.